These toys were hidden for centuries at the church of St Dionysius. Find out more below! Dating from the early 17th century, a unique hoard of more than 200 toys was found behind a bricked-up stairwell in St. Dionysius Church in the centre of Market Harborough. The toys include whip-tops, tip-cats, small balls and sap whistles. 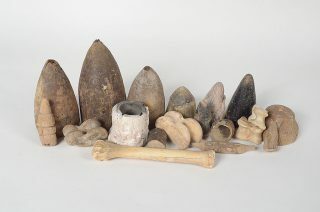 They were made from wood, pig’s knuckle bones and fabrics, all easily obtainable materials to children who had to make their own toys long before such things were mass-produced. Could this hoard be confiscated toys taken from children causing trouble around the church more than 300 years ago? 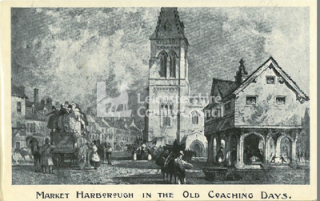 A selection of the Harborough Toys. St Dionysius was originally a chapel and was first mentioned in 1220 when it was dependent on the parish church of St Mary’s at Arden but St Marys gradually fell into disuse and is now a ruin near the railway station. There are ten bells in the belfry. Eight of the bells were recast in 1901 and two new bells were added in 1990. The earliest parts of the church date from the 13th century, with most features dating from 14th and 15th centuries. Part of the tower was destroyed in a storm in 1735 and the replacement was re-built several feet shorter. The original pews date from 1751 and these were re-placed by ‘Boxed pews’ in 1836 which were extended east in 1844. Again, restoration work was carried out in 1857 when the pews were cut down in height to about 3 ft. The north windows were similar but one is now missing. The flowing tracery in the five-light east windows has been replaced, but is said to be a copy of the original. During whitewashing in 1770 a painting of the Crucifixion and the date 1434 were found above the chancel arch but today this doesn’t exist. Also fragments of a medieval wall painting was discovered in 1959 at east end of North Aisle. Come and admire the Harborough Toys and the church of St Dionsyius when you visit the Christmas Market, from Friday 30th November to Sunday 2nd December. Find out more here.